Call me cheap, but I can't bare to throw out an old pot of coffee. So started my quest for a delicious, as good as the coffee houses iced coffee ... I do believe I've done it. 1. Perk a pot of coffee, or go to your coffee maker and take the leftover coffee in the pot, pour it into a container and put in the fridge. I use a mason jar and just keep adding to it. 2. Make Simple Sugar Mixture - Boil 1 cup water then add 1 cup of white sugar , stir until dissolved. 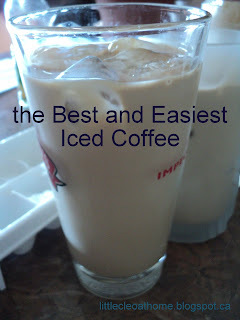 Put in fridge to cool (for at least 30 minutes or so) This is so easy and this is what makes the iced coffee work. Just make it and keep it in the fridge for when you want to mix up a cool one. 3. Add to your Simple Sugar Mixture 1tsp of Vanilla & 1/2 tsp of Almond Extract and stir. This is my secret ingredient that makes the coffee absolutely amazing! I am thinking you could easily add peppermint extract or whatever flavour you would like to make it exactly how you want it. 4. Grab your favourite drinking glass, the bigger the better. Fill with ice cubes, then fill 2/3 with black coffee, more or less depending on if you want it darker or creamier. 5. Take your Simple Sugar and add until you've increased the level of the liquid by about an inch. Then top with Cream ... for a lower fat version, use 2%, 1% or almond milk. Stir and Enjoy!! Mmmmmm ... isn't it yum?!! Thanks for stopping by my blog. This looks very good. We'll have to give it a try!